Plans to re-connect Portishead in North Somerset to the passenger rail network are due to move a step closer. 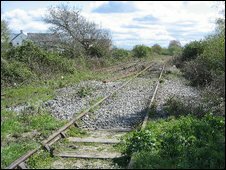 Network Rail is to carry out a study into how feasible it would be to put the line back in service and to build a new railway station. The section under the spotlight is three miles of line from Portbury Docks into Portishead town centre. It has remained closed since 1964 despite a vociferous local campaign to get it reinstated. The study, costing some £164,000, will look at potential engineering problems, any conflicts with the freight-only service which operates along the first part of the route to Portbury Docks and the cost of reopening a full passenger service. Deputy leader of North Somerset Council Elphin Ap Rees said the study is "an important step forward" towards trying to improve the transport infrastructure of Portishead.